Most days I go outside, walk around and look at all the plants, offer an encouraging word here and there and pull up invasive species. This morning while wandering around the farm, I forgot that the antique rose was blooming, was instead drawn to the red peony. While it's scent is not as powerful as the white one next to it, the color is deep and vibrant and the flowers more tightly spun. As I have grown older, my olfactory senses have seriously declined, so I was excited to be able to inhale and enjoy the deep musky perfume of the white one. These are old plants, at least 50 years. I've been here for 44 and they were already large when we came. Seven of eight remain; one having been relocated to daughter no. four's home. A story about the red peony. Years ago when I raised French Alpine dairy goats, there was a developing market in Taiwan for goats to use in dairies. Four very polite Taiwanese guys visited my farm and took pictures of the does I had for sale. 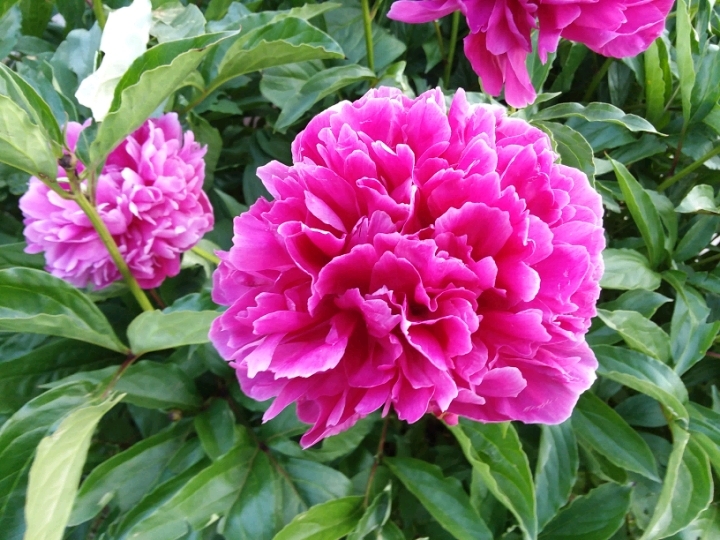 While walking to the barn, one of the men paused and looked at the red peony. Most formal was his request to dig up a start of the plant and take it home with him. Now when I look at the red peony I remember the day and I wonder if somewhere she is thriving in a far away garden. 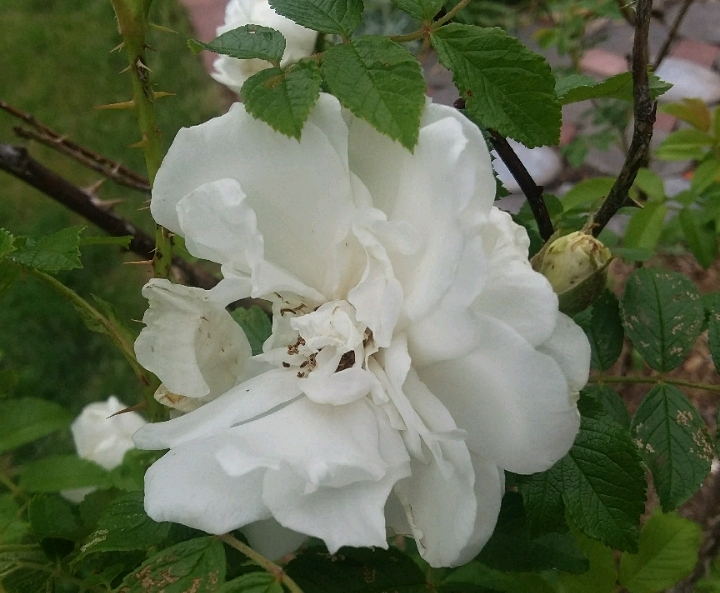 I may go back out and smell the old white rose. She deserves that. Especially so since we did some serious pruning a few weeks back. For sure everything out here has a history and a story. I guess that's what happens when you stay in one place for a long time. One of my Rainbow Family friends said that we here on the farm were trees, deeply rooted in the ground. Sweet entry...now I wonder about the flower...where she is & if she is thriving too! A great mystery, but do hope so. Beautiful flowers. Thanks for putting this up! I didn't know what peonies were. And have never smelt one. They sound divine! I didn't know you had goats! I have never had French Alpine Goats. I have seen, but not owned, British Alpine Goats. They were pretty. Did the Taiwanese guys take any goats? What is that thing on your path? Is it a dog's toy? They have a very heavy scent but I love it, usualky cut some and bring tgrm in the house. Had goats of all kinds for many years, some were Alpines, some Toggenburgs and even a Nubian. It all got started with the kids wanting them for a 4-H project (4-H being a farm oriented youth group). Then I became interested and we ended up with a herd. Used to show them all over the state. Finally kids grew up and I got tired of milking in the winter so we sold out. Miss the goats and the milk, but not the work. And you are right, dog toy on the path. Oh as best as I can remember they did buy a couple of milkers. I'm sure I'd love them...as long as they didn't fill my house full of scent! 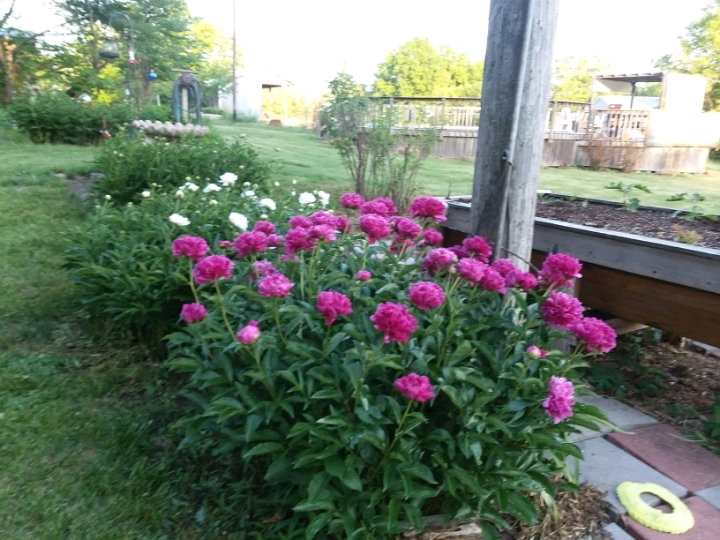 Peonies are my favorite flowers. For me hard to choose between peonies and roses. Love your story. I was immediately engaged. If I had had goats that gave milk that tasted like french vanilla I'd be a rich woman today LOL. Very cool but you were raised on goat milk. Quite often it is tolerated by children and cannot drink cow's milk. I mostly used it to make cheese because as you know it doesn't taste anything like cows milk. Thanks for the compliment on the writing. It seems that I've not been very inspired in that direction lately, mostly I've been pulling a lot of weeds.